Today’s adventures were all about tracking wildlife and making our own new tracks. The day started with observing members of two different packs of wolves – the Blacktails and the Mollies. Colby, the wolf survey tech, was extremely engaging and informative when describing the work being done to study the wolf populations – including the many ecological facets of the study. He talked about both predator-prey interactions such as those with elk and bison, and predator-predator interactions where wolves compete for territory and resources with cougar (Mountain Lion) and coyote. A result of these interactions is often the death of one of the predators, and from the wolves’ standpoint, these predator-predator interactions are not for sustenance but to remove competitors. 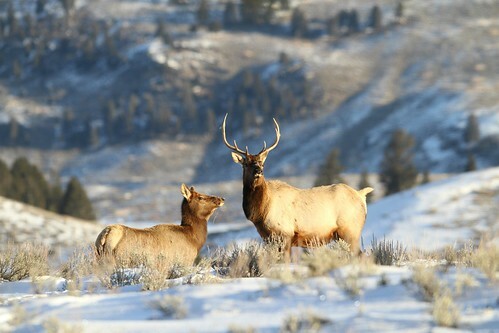 Firsthand, we observed interaction with members of the Mollies pack and bull elk. There was a standoff on a ridge where both species appeared to be standing their ground. We learned that these events can last for hours to days, until the wolves either lose interest or the prey is brought down. Some clever elk will run into rivers (where wolves do not like to go) during predation and standoffs can occur along river banks. After our adventure tracking wolves, we ventured into the small town of Cooke City (resident population of ≈50), which is just outside the northeast entrance to Yellowstone. In Cooke City, the tracks we followed changed from natural tracks to those made by noisy snowmobiles, a commodity for which Cooke City is known. Cooke City exposed us to a completely different way of life – one in which the closest grocery store and town is two hours away! Part of our visit included a tour of the local K-8 school house, which currently has three students — a kindergartner and two second graders. 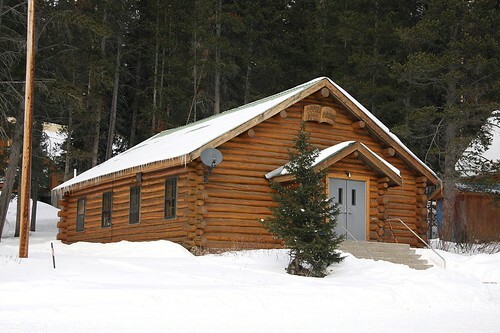 Being a group of teachers, we were amazed not only at the small class size, but also the opportunities the students were afforded, even in this small town that was so far from what we would consider civilization. For example, today and for several upcoming Fridays, a music teacher from Gardiner was teaching the students violin, with the lessons culminating in a school field trip to the symphony! 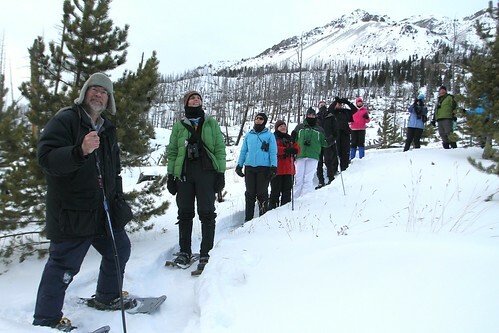 Our day of tracks concluded with Dan and Cindy Hartman in Silver Gate making our own tracks — snowshoeing! A highlight of the day was getting to trek up a snow covered hill and through the woods, with a spectacular view of the surrounding mountains. We had a view of the hillsides of trees impacted by the 1988 wildfires that burned a large portion of Yellowstone (approximately 30%) and threatened to take Silver Gate and Cooke City. Many of the skeleton trees remain on the hillsides while new saplings are slowly growing up around them. As we hiked in our snowshoes, we also observed many different animal tracks. There was evidence of: a large Pine Marten, Red Squirrel, fox, coyote, grouse, and rabbit. The grouse would fly from a perch in a tree, land deep in the snow, and nest for the night. At morning, the grouse would appear from deep within the snow and fly off. Our day of tracks, both observing and making, was awe-inspiring and an insightful view into the life of the wildlife and the people who love the Yellowstone area.